Scarborough look set to play Blackburn, who are likely to be the North One West runners-up, in the play-off for a place in North Premier next season. The home team will be the side with the runners-up with the superior playing record, so the final home league of the season at Silver Royd against Bradford & Bingley next Saturday now has extra importance. The visitors made a superb start, with Aussie ace Jimmy Perrett races onto a kick through to go over in the corner to make it 5-0 after only four minutes. Seven minutes later Perrett raced through onto another kick through and with the conversion Scarborough had pulled into an early 12-0 lead thanks to a Tom Ratcliffe conversion. On 15 minutes Scarborough made it 19-0 when Drew Govier caught a wayward Scarborough line-out and went over from close-range, Ratcliffe kicking the conversion. The visitors secured their bonus point two minutes later, Ratcliffe with the break, chipping over the last defender and collecting to go over between the posts and converting for a 26-0 lead. Malton then started to get their way back into the game and were reward with a try on the half-hour mark to make it 26-5. After the break Malton scored their second try, going through the phases from one end of the pitch to the other and the hosts reduced the deficit to 26-10. 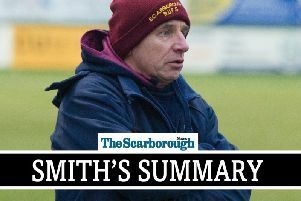 Scarborough eased the pressure a little with their first try of the second half on 58 minutes, a break by Ratcliffe, lightening quick by Perrett and Drew Govier finished for his second try of the game to make it 31-10. Shortly afterwards, unbelievable pace from Perrett saw him make up a 20-yard deficit to romp past the defender and put the away side 38-10 ahead. Perret's fourth try then made it 43-10 to Scarborough, and although the home side replied with another try Scarborough held on for a 43-17 win.